I have a question for those of you who have had your bostons and have had children. I know all dogs each have their own temperaments and stuff, but what have your experiences been with newborns? I'm due in July of next year and both of our Bostons will be a year old by then. They're both very sociable; adore people in fact... but they've never been around teeny babies. Any advice or suggestions would be great! What my sister did was bring the baby blanket the baby was wrapped in home for hers to smell before she took the baby home. Her dog kinda runs from her other kids anyway because sometimes they annoy him..heh. I even brought my guy over to visit and he didn't bother with her baby, he was curious about the baby swing though but I told him to leave it alone. I guess the standing rule with any dog and children is just never leave them alone together. Hope some of this helps you. Congrats on the new addition to your family too!!! 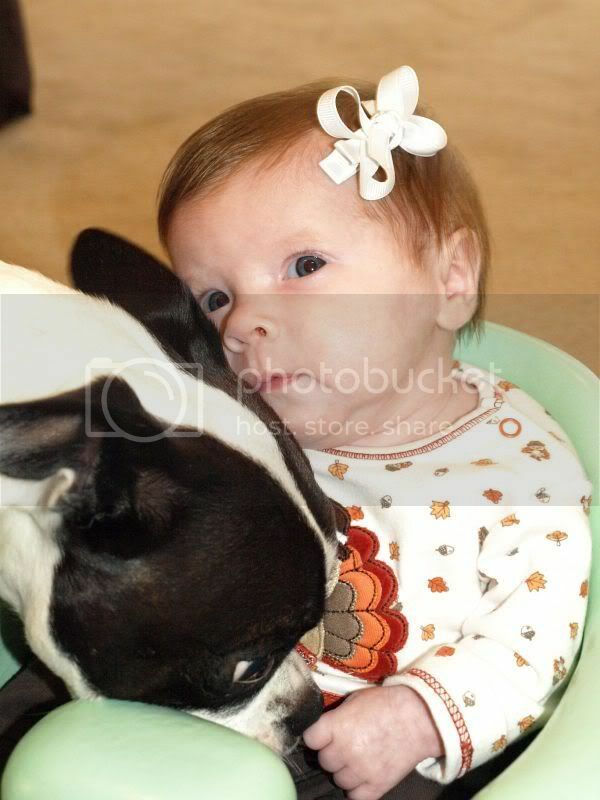 Our boston was a cranky old 16 when we had our daughter. You would think I had brought home Sassy a puppy, not my own child. It depends on your dogs temperment, and I would take it slow, but IME with Sassy, it was not an issue at all, the only "problem" is that Sassy would get horribly distressed when Ellie would cry. 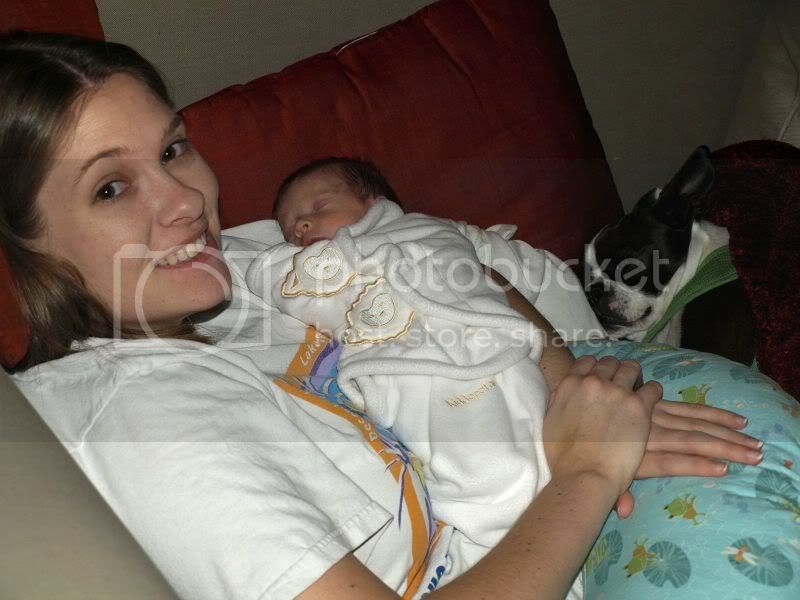 I just had a baby at the end of Sept. She was in the NICU for 2 weeks but when she came home Kermit was get. We just made sure to let Kermie do everything she was allowed to before...Kermie just wanted to be with me like usual so we all just cuddled on the couch. :) Kermie follows us into the baby's room when we change diapers and such and has even taking to sleeping in the living room where the bassinet is rather than our bed. We have taken her and the baby on lots of walks and try to do "special" things with just here - taking her in the car when one of us picks up food, etc. She is normally kinda hyper, but seems to know that Ansley is different. She just very gently licks the back of her head or feet :) It is sweet actually. sorry the pics are so big!